Called the "Limestone City" because it contains many white-stone buildings, Kingston served as the first capital of Canada. 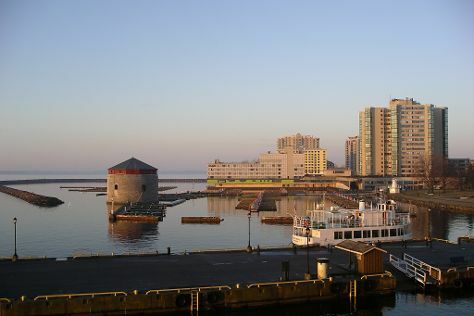 Though it lost its status as the country's top administrative center long ago, Kingston is now one of Canada's richest destinations in terms of history and culture. Visitors tour Kingston to see its many old churches, civic buildings, and 19th-century fortifications, built in the 1840s to defend the area from potential attacks from the United States. The city also boasts a lively nightlife scene and serves as a relaxing weekend getaway for residents of Ottawa, Toronto, and Montreal. Kingston is in Ontario. Add Kingston and other Canada destinations to your travel plans using our Canada tour itinerary app . The most desirable accommodations in Kingston line the waterfront in the city's downtown region, offering views over the wide St. Lawrence River. If you want to immerse yourself in the city's hippest scene, look slightly west to the area around Queen's University, where you'll also enjoy easy access to some of Kingston's most pleasant parks. Those hoping to take some road trips out of the city should consider staying at one of the many motels and guesthouses along Princess Street--there, you're perfectly placed to hit the road and explore the region.